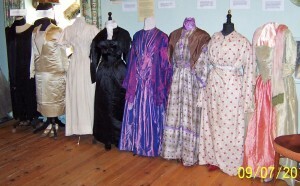 These historic dresses are owned by Sutton Heritage Society. They were bought when the contents of Skegby Hall were sold by auction at Phillips’ sale room in London in 1995. Two Society members made a successful bid and as a result the dresses were preserved for the benefit of the local community. Unfortunately, a home could not be found for them to be displayed locally and they were stored for fifteen years by a member of the society. They were exhibited locally from time to time. In 2010 we were fortunate to have help in finding a home for them at Hope House Costume Museum in Derbyshire where they are on display at the discretion of the proprietor. The oldest dress in the photograph is the green and coral silk gown c1720 to be seen on the right of the photograph. The cream dress, third from the left is a wedding dress c1890 with a 17 inch waist. 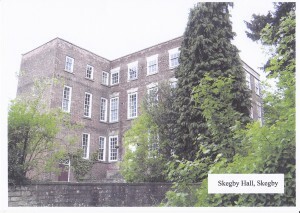 There are many other items in the collection from the late 18th century and 19th century. Some items have been displayed at local shows and it is intended to do this when opportunities arise.